Adell will actually get hit with a felony for the player playing too long. Woah. Some base stats enhanced by equipment. Tink’s felonies include “being a loser”, excessive force, and “existing”. Aurelia, a Blue Mage, has too many murders and Geo Vandalism on her rap sheet. Garlic Water: “Why would anyone drink this?” Because they’re Wario? From the “should they really be joking about this?” file. There’s also a weapon called Father’s Fist. Just thought you should know. Elven Bow: “A famous elf used it to return a lost ring.” Ooh, is it Link?! Let’s not get too ahead of ourselves here. I react much the same way when someone tells me calm down. April 4th, 2016: The crew finally found Zenon again. Oh, great, Adell. Sure, taunt the fake, egomaniacal, power-hungry Overlord. March 23rd, 2016: Once the crew entered Zenon’s Castle, a pained Zenon appeared before them. Rozalin told the imposter that she would cleanse her father’s legacy by beating him. In the cutscenes before the levels in this chapter, each character ruminates upon their fears and wishes as the final battle looms over them. Meanwhile, back at home, Mom noticed that Fubuki must have gone after Zenon again. Rozalin was ready and raring to find him, and Taro and Hanako knew how to get to Zenon’s castle via Gate AX666. Wait, that was important?! February 17th, 2016: Zenon was relieved that he destroyed the Snow Clan after he was nearly killed by Fubuki. The masked man warned Zenon that strengthening the curse posed further danger to him, but the Overlord had to recover from the last battle. March 9th, 2016: Zenon’s curse got stronger, and Dad’s bod got possessed by his pimple! Dad thought that Adell’s birth parents had something to do with Zenon’s curse. You’re not helping! In fact, you made Dad forget what he was gonna say! I hate Invincibility Geo Crystals… when I’m not the one using them. As the crew ascended the Tower, it suddenly began to shake. A coarse and wicked laughter broke out. A blue-haired boy with a red scarf teleported in. “You ate them!!? With those herbs, I might’ve rcovered my levels! I’ll bet Laharl’s level is really huge. Called it: it’s twelve thousand. Well, at least it’s not nine thousand! Ha. I thought you were better than this to pull this hopeless boss fight crap, game. A symbol appeared before Rozalin. A seal. Laharl could not resist breaking it with his sword. Unfortunately for him, that unleashed a new side of the princess. Her eyes turned black and red. Laharl attacked her to no effect. Laharl still puts up a fight. Their hissy fits may result in counter-counter-counter-attacks. 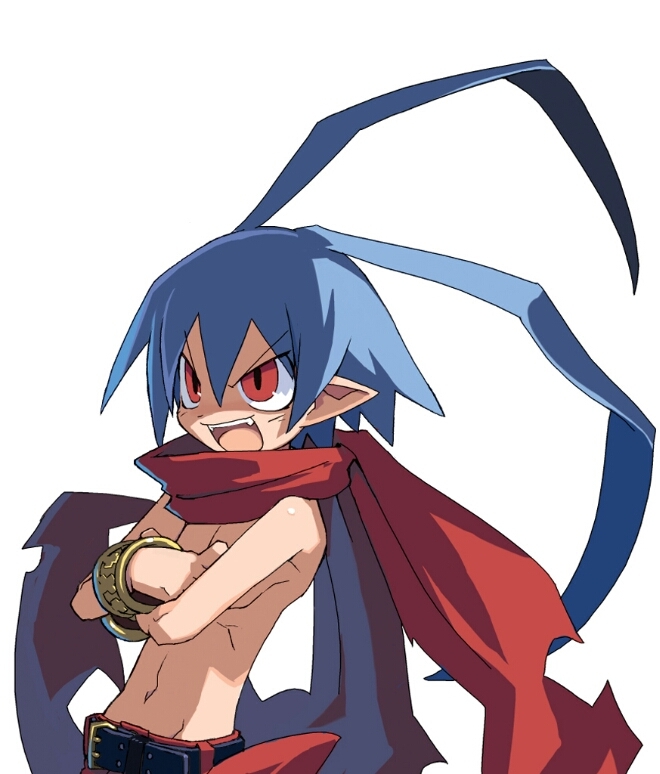 Laharl was shocked that he lost, but he lost none of his confidence. He teleported away. She tried to attack Etna with a lightning bolt. Adell… slapped Rozalin, and toldher told her to get a grip on herself. The seal returned. She suddenly fell backwards, but Adell caught her before she hit the floor. The news. Axel reported that Zenon returned to Veldime. The Director filmed Axel’s family so that they could stage and intervention for him. His little brother led the charge. Axel told Director to return to Veldime to direct the one and only Dark Hero. Director pledged to put his whole heart into it. At least Rozalin took Laharl down a peg. March 22nd, 2010: The party brought Fubuki back to Adell’s village. Rozalin used the Remedy that the party won from the Colosseum to stabilize his condition. Yukimaru was surprised but moved by the act. February 10th, 2010: I encountered new enemies in an Item World’s Mystery Room. They were Death Sabers, and they looked as cute as their name isn’t. They looked like superdeformed chibi characters in cat costumes! Aww. The description for Ninja Tabi says, “Sneak up and snap some necks!” IS THAT A REFERENCE TO SOUL NOMAD?! SN had Danette, a silly girl with a battle cry that was basically, “Let’s snap some necks!” and variations thereof. However, despite the many different acts of cruelty in that game, I don’t remember anyone snapping any necks. February 6th, 2010: So I bribed the Dark Assembly to unlock the “See the ending” option. Now, under “Area Select”, that is one of the options! Let’s see where it takes us.